Analog Science Fiction and Fact ed. by John W. Campbell, Jr.
ERB-dom ed. by Camille Cazedessus, Jr. 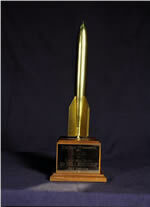 Final Ballot Voting Note: Under the rules in force at the time, Hugo Award voting was “first past the post,” meaning that the nominee with more votes than any other nominee (not necessarily a majority) won the Award.